Alex Wong/Getty ImagesU.S. 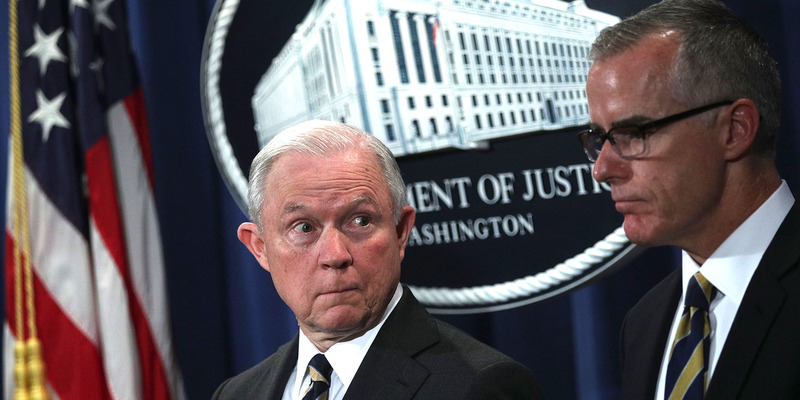 Attorney General Jeff Sessions (L) and Acting FBI Director Andrew McCabe (R) during a news conference to announce significant law enforcement actions July 13, 2017 at the Justice Department in Washington, DC. Attorney General Jeff Sessions held the news conference to announce the 2017 health care fraud takedown. Former FBI deputy director Andrew McCabe reportedly oversaw a criminal investigation last year into whether Attorney General Jeff Sessions “lacked candor” when testifying before Congress during his confirmation hearing in January 2017. One source told ABC News Sessions was not aware of the investigation, which has since been closed, when he fired McCabe last week. Sessions’ testimony before Congress in January and November of 2017 has repeatedly drawn scrutiny over whether he misled lawmakers. Former FBI deputy director Andrew McCabe oversaw a criminal inquiry into Attorney General Jeff Sessions over his testimony to Congress about his contacts with Russian officials, ABC News reported Wednesday. People familiar with the matter told the outlet that the investigation into Sessions was predicated on whether he “lacked candor” when testifying before Congress during his confirmation hearing about his conversations with Russian officials. During his confirmation hearing in January 2017, Sessions told lawmakers that he did not communicate with any Russian officials about the 2016 US election. Later, The Washington Post reported that Sessions met twice with Sergei Kislyak, then Russia’s ambassador to the US, during the campaign and transition period. Following the revelation, Sessions admitted that he had met with Kislyak twice in 2016, but that none of their conversations were related to the election. Shortly after, he recused himself from any Department of Justice investigations into the Trump or Clinton campaigns. McCabe and Deputy Attorney General Rod Rosenstein are said to have informed lawmakers of the investigation during a classified briefing last year. Sessions’ attorney, Chuck Cooper, told ABC News that the FBI investigation into his disclosure of Russia contacts had been closed following his interview with the special counsel Robert Mueller in January. “The Special Counsel’s office has informed me that after interviewing the attorney general and conducting additional investigation, the attorney general is not under investigation for false statements or perjury in his confirmation hearing testimony and related written submissions to Congress,” Cooper said in a statement. One source told the outlet that Sessions was not aware of the investigation into his conduct when he fired McCabe as FBI deputy director last Friday. But Sessions’ attorney declined to confirm that, ABC reported. McCabe was forced out of the FBI last week amid an internal investigation by the Office of the Inspector General. The inquiry looked into his approval of unauthorised disclosures to the media in October 2016 related to the bureau’s Hillary Clinton email probe. The inspector general, Michael Horowitz, concluded in a report that McCabe was not forthcoming during the OIG review. The full report has not yet been released. The FBI’s Office of Professional Responsibility subsequently recommended that Attorney General Jeff Sessions fire McCabe, according to The New York Times. Sessions’ statements about his Russia contacts are not the only time his testimony before lawmakers has attracted scrutiny. Last November, early Trump campaign foreign-policy aide George Papadopoulos told investigators that he had proposed a meeting between candidate Trump and Russian President Vladimir Putin in March 2016, during a meeting which included Trump, Sessions, and other campaign foreign-policy advisers. Sessions told the House Judiciary Committee that he had “pushed back” against the proposed meeting. But three witnesses in Mueller’s investigation countered Sessions’ account last weekend, telling Reuters the attorney general did not challenge Papadopoulos’ proposal. Michal Kranz contributed to this report.